To sign in, navigate to the Mattermost sign-in page. You can get the URL of the sign-in page from your administrator. After signing in, the team that appears first on your team sidebar will open. If you have not joined a team, the Team Selection page opens where you can view a list of teams that you can join. There are several options for signing in to your team depending on how your System Admin has configured your server. When enabled by your System Admin, you can sign in with the username or email address used to create your account. If you have forgotten your password, you can reset it by clicking I forgot my password on the sign in screen, or contact your System Admin for help resetting your password. When enabled by your System Admin, you can sign in using your GitLab account using a one-click sign in option. When enabled by your System Admin, you can sign in using your Google account using a one-click sign in option. When enabled by your System Admin, you can sign in using your Office 365 account using a one-click sign in option. When enabled by your System Admin, you can sign in with your AD/LDAP credentials. 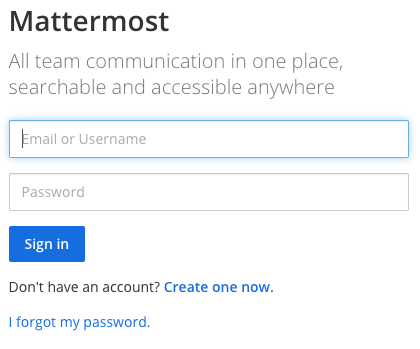 This lets you use the same username and password for Mattermost that you use for various other company services. When enabled by your System Admin, you can sign in with your SAML credentials. 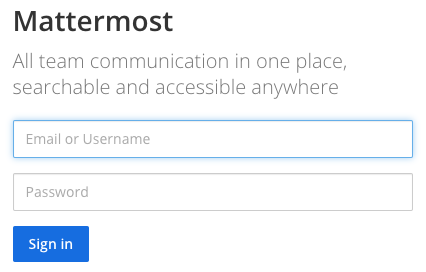 This lets you use the same username and password for Mattermost that you use for various other company services. Mattermost officially supports Okta and Microsoft ADFS as an identity provider (IDP) for SAML, but you may use other SAML IDPs as well. Please see documentation to learn more about configuring SAML for Mattermost. You can switch between teams you have joined using the team sidebar that appears left of your channel list on the left-hand sidebar. 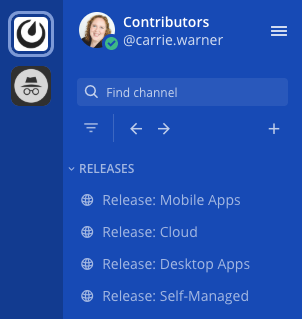 You can set your status as online, away, do not disturb, or offline by selecting a status from the menu that appears when you click your avatar at the top of the channel list. Do not disturb disables desktop and push notifications. You can log out from the Main Menu, which is accessed by clicking the three dots in the top header on the left side of the screen. Clicking Logout logs you out of all teams on the server. 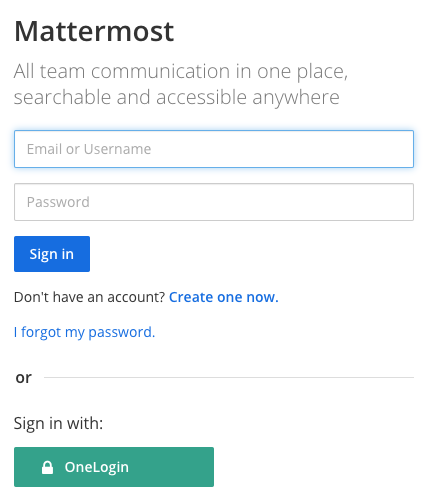 Your Mattermost teams can be accessed on iOS mobile devices by downloading the Mattermost App. Open the App Store on your Apple device running iOS 9.0 or later. Search for “Mattermost” and click GET to download the App for free. Enter Server URL: This is the web address you go to when you want to access Mattermost. You can find the Server URL by asking your System Admin or by looking at the address bar in a desktop browser tab with Mattermost open. It is in the form https://domain.com. Sign in to Mattermost: This is your account login information as described by one of the sign in methods above. Your Mattermost teams can be accessed on Android mobile devices by downloading the Mattermost App. Search for “Mattermost” and click INSTALL to download the App for free.